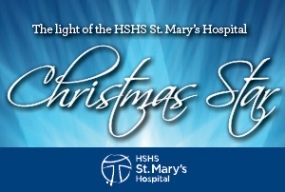 Each year, HSHS St. Mary’s Hospital honors and memorializes the loved ones of colleagues and members of the community through sponsorship of Christmas lights on the start that sits atop the hospital. The 700 lights on the star, donated by the late Dr. John “Rocky” White, represent the loved ones of colleagues, volunteers and community supporters. The lights are purchased for a suggested minimum $50 donation in memory or honor of loved ones. On November 15th, Byers & Co. will broadcast live from the hospital from 6 am to 9 am. You will be able to purchase a light for a loved one by calling 217-464-7655. Or purchase online by clicking HERE. The Star Light Ceremony will be held on November 28, at 6:00 p.m. in the Assisi Room at HSHS St. Mary’s Hospital.